There was one work very close to the heart of Gemma during the latter years of her life: the foundation of a Convent of Passionist nuns at Lucca. 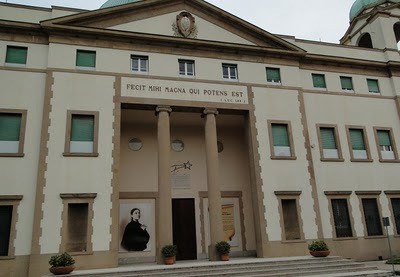 At that time the Convent at Corneto was the only convent of Passionist nuns in the whole of Italy. Gemma had for years before her acquaintance with the Passionists longed for the life of a cloistered religious, and besides the ineffectual attempt to enter the Visitation had made others with the Carmelites, Capuchins and Mantellate, all equally unsuccessful. 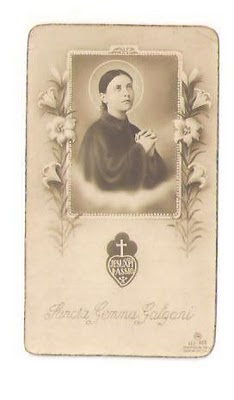 But from the time of her miraculous cure through the interecession of St. Gabriele Possenti, her thoughts turned towards the Passionists, for had not S. Gabriele called her his 'sister' during his heavenly appearences? [St Gabriele was a Passionist brother who had died a holy death 37 years before]. When she made her first confession to the Passionist Father Gaetano and told him how eagerly she desired the life of the cloister, he had replied: "We have Passionist nuns," and from that time she ardently longed to become one of them. The mission began, and I went to confession, and said I wanted to become a nun, the confessor said: 'There are Passionist nuns.' From that moment I am always thinking of those words and want to become a Passionist. I said the same to my confessor; he also was pleased and said he desired a strict rule for me. From that time my devotion to S. Gabriele increased, and I began to beg him to grant me the grace to be a nun very soon." "One day I heard about the idea of founding a convent of Passionist nuns in Lucca, and thought at once I would ask S. Gabriele about it. 'Will the convent really be founded?' He answered: 'Not for another two years,' but he assured me it would be realized. I asked him if I might be a Passionist? He replied: 'You will be my sister.' 'But where? Must I go to Corneto ?' He answered: 'Why go so far? ' 'To forget all, and to be forgotten by all?' He did not reply, but blessed me and disappeared. Father, help me to become a Passionist; my will is resolute, help me. I cannot wait longer, I have nothing. I am very poor, but I have the desire." Later on she returns to the same subject: "A short time ago a Passionist father told me that in October the Passionist nuns open their novitiate. Can I hope that the lowest place there may be for the humblest daughter of St. Paul [St Paul of the Cross, founder of the Passionist Order]. I will be good and obedient. Tell the nuns that if they will have me I shall be their servant. I can sweep, wash dishes, draw water, and do needlework .... If you knew how much I suffer in not being a Passionist, . . . Jesus consoles me and says there is a life even more blessed than that of a convent." This incident seems to have been repeated, for in another letter she says: "The other morning after Holy Communion I asked Jesus to send me into a convent (it is the first grace I always ask of Him), and He answered: 'My daughter, there is a life more blessed than that in a convent,' and He added nothing more. I have asked myself often what this life could be, but have not been able to find out. Still the desire of being a religious is very great, and constantly in my mind." "Tell Me, daughter, do you love Me very much?' Oh, father, the pounding of my heart gave answer. 'And if you love Me,' He continued, 'then you will do what I will.' My heart answered for me, and Jesus said: 'It is an important matter, My daughter. You will have great things to tell your director. What ingratitude and wickedness there is in the world! Sinners continue to live obstinately in their sins. My Father will bear with them no longer. The depraved have no strength to over¬come their sins. The afflicted fall into confusion and despair. The fervent become tepid. The ministers of My sanctuary ... (here Jesus was silent, and after some minutes continued), I have entrusted to them the great work of continuing the Redemption ... (Jesus again was silent). 'I have need of souls who will give Me consolation in place of the many who give Me sorrow. I have need of victims, strong victims in order to appease the just wrath of My Father... My daughter, write at once to your father, and tell him to go to Rome and speak of My desire to the Holy Father, tell him a great chastisement is threatening, and that I have need of victims. That My Heavenly Father is exceedingly wrath. I assure you it will give great satisfaction to Me to have a new foundation of Passionist nuns in Lucca, thus increasing the number of souls that I can present to My Father to appease his indignation. Say also that these are My words and the last warning that I shall give.' "
In another letter Gemma speaks of a vision she had of St. Gabriele, who said: "Gemma, have you nothing to tell me ? ' 'Oh, yes, I have much to tell you; also from the confessor. He wants to know about this convent which is to be, and who will begin the work, when it must be finished, and what time yet remains? ' When I had said this, I saw seven girls before me, and S. Gabriele made me look at each one; there were seven and I knew three of them. [These were the first young girls to enter the new Monastery, three of whom were well known to Gemma] 'Who are these?' I asked. 'They will be Passionists. Tell your confessor it is he who ought to begin this great work. Tell him to take courage, the devil will make a strong resistance. But what does it matter? Forward!' He was silent, and then showed me a young girl and said: 'Look, this is she who will give the finishing stroke to the work. Do you know her?' 'No,' I replied. He told me her name and surname, and the city in which she had been born and brought up; then all disappeared." "I was rather unsure about it all, and the vision was repeated three times, and the third time he added: ‘After two years have passed on a Wednesday the work will be begun.' "
During this time Gemma ardently desired to make a retreat in the Passionist Convent at Corneto in company with Signora Cecilia, and the two eldest Giannini girls. Her confessor, Monsignor Volpi also wished it. Signora Cecilia wrote at once to the Superioress: "Annetta, Euphemia and myself would like to make a retreat, also a young girl, an orphan, who is with us, Gemma Galgani." "But would you believe it," wrote Signora Cecilia to Father Germano, "the Superior replied that she could not accept her (Gemma) on account of the opposition of the nuns who had heard a great deal of talk about her from different people. Just think of this poor young girl who would have been so happy to go." The members of the Giannini household were indignant at the letter of the Superior and the way she had spoken, and murmured against both Superior and convent, but Gemma, who had suffered so intensely, was instantly in defence of the Superior. "What are you saying," she exclaimed. "Do not speak unkindly of the Superior. I desire her so much good, and when I am in Paradise she will be the first I shall meet and welcome." Writing to a friend about a dream she had, Gemma says: "I recognised the Mother Superior. She looked at me very sternly. I wished her so much good, but she said nothing to me, absolutely nothing." Nothing could turn Gemma aside from her love for the Passionists, nor from the conviction that a convent of these nuns would be established in Lucca. She had hoped to be one of them, but already Jesus had spoken to her of a better life than that in a convent, and to that life Gemma was destined soon to come. Finally, it was revealed to her that if the convent was not founded within six months Jesus would take her to Himself. "Decide at once," she wrote to Father Germano, "for very soon it will be too late. Jesus will not wait longer, for He has said He will take Me to Himself within six months if the work is not begun. My heavenly Mamma cured me of a dangerous illness, but on condition that the con¬vent is founded. If it is not started without delay she will cause me to fall ill again and will come and take me away with her." Some time later Jesus revealed to her that these conditions that He had desired would not be fulfilled, and she had to renounce the hope of being one of the nuns in the new foundation. Things had progressed very little in spite of all Gemma's prayers and pleadings, and after this revelation she wrote to her spiritual father thus: "All is over. Yesterday evening at the midnight Mass, when the priest had reached the offertory, I saw Jesus offer me as Victim to His Eternal Father. I was so happy, so contented, and then Jesus took me to our Mother, and presented me to her, saying: 'This is my beloved daughter. She is the fruit of my Passion,' and a little afterwards I went to receive Jesus [in Holy Communion]. This morning I renewed my vows to Jesus. I besought Him to accept the renunciation of my desire and unite me to His Holy Passion.' "
St. Gabriele appeared to her yet again: "After over three months, last evening, with the confessor's permission, I saw S. Gabriele, and with what power he spoke. His eyes flamed with fire. Speaking about the new convent, how much he lamented that nothing had been done to hasten its erection." "Father you have understood? I live in continual suffering, but in peace and quiet. I no longer ask to be received into the convent, as a better convent awaits me! I asked a sign of my dear Mamma that might assure me she was the Mother of God, and she said: 'I will restore your health, then you will be assured.' [And in fact just after this Gamma did get well for a short time. But since the condition that Our Lady had imposed was not being fulfilled, Gemma fell ill again and soon died.] Father, think over carefully what I have written." "With fatherly affection we bless the foundation of the new Convent of Passionist Nuns in the City of Lucca, our venerable brother, Nicola Ghilardi (Archbishop of Lucca) who, with praiseworthy zeal, is promoting it, Rev. Mother Maria Giuseppa of the Heart of Jesus, who is to be its first Superior; all benefactors who have helped or shall co-operate in its establishment, and the religious present and future who shall form part of it. "We wish the above-named pious virgins, in all their prayers, penances, devout practices and other exercises prescribed by the Institute, to have as the special end of their community, that of offering themselves as victims to our Lord for the spiritual and temporal needs of the Church and the Pope." After this the work went forward rapidly, and Father Germano had the consolation not only of seeing the convent firmly established, but also seeing a steady flow of vocations assuring it of a prosperous future. In the end, all of Gemma's prophecies were fulfilled to the letter. All happened exactly as it was revealed to her. It is interesting to note that the first Superior of Lucca was the very nun to whom Gemma had written: "Jesus will give you this consolation." 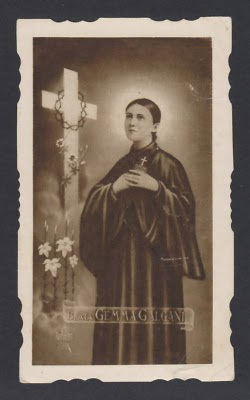 And to note also that Gemma's prophecy about herself has also been fulfilled: "If they [the Passionists] will not have me in life they will have me in death." For to this day her body rests within the main altar of the Passionist Monastery Church at Lucca that bears her name. Primary source for this article is the excellent book “Blessed Gemma Galgani” by Benedict Williamson, 1933, 2nd edition. The 1st edition of this book was published under the title “Gemma of Lucca”, 1932. The articles on this website just keep getting better and better...Thanks!